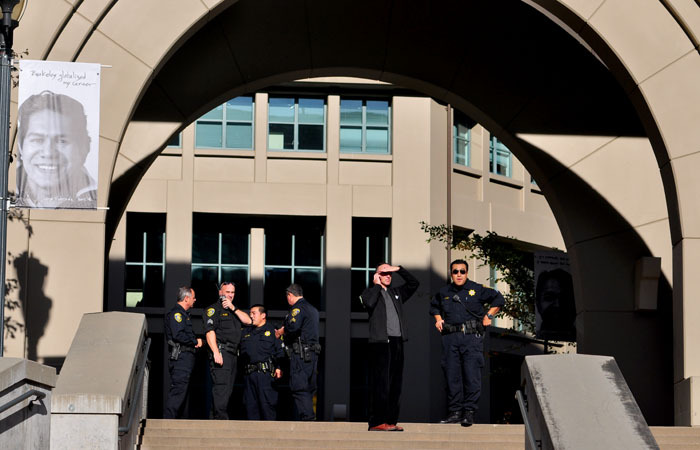 According to UCPD Chief Mitch Celaya, officers arrived at the business school at 2:19 p.m. in response to a report that someone in the building had a gun. Celaya said at the press conference that after three officers entered a computer lab at the school and approached the suspect, he pulled out the gun and displayed it in a “threatening” way, leading one of the officers to shoot the suspect out of fear for his safety and that of the other officers and students in the lab. He added that at one point there were four students between the suspect and the officers. There have been no other reported injuries. UC Berkeley Chancellor Robert Birgeneau said at the press conference that witnesses have reported that they heard the police order the suspect to lower his gun. The suspect was taken to Highland Hospital in Oakland. He was conscious when he was transported out of the school, according to Celaya. Celaya could not confirm the suspect’s motivation, identity or student status but said he was described as a 5-foot-8-inch white male in his 20s wearing blue jeans and a blue jacket. He was also unable to say whether the suspect’s gun was loaded at the time of the incident. “I cannot tell you how sorry I am that we are having this press conference,” Birgeneau said at the 4 p.m. conference. According to Birgeneau, police were alerted after a staff member from the building saw what she thought might be a gun in the suspect’s backpack when they were in an elevator together. It is possible that there was a camera present in the room during the shooting, though it is unclear whether it was functioning, according to Celaya. Birgeneau said the last shooting on campus he could remember occurred in the 1980s. “Now we are there, along with Kent State and Virginia Tech,” he said at the conference. The school was closed following the incident but was reopened shortly thereafter with the exception of the area where the shooting occurred. Jordan Bach-Lombardo and Javier Panzar of The Daily Californian contributed to this report.